The Mill Park brand is synonymous with quality and what better place to bring the best of the best than to the 2019 Inglis Australian Easter Yearling Sale (April 9 and 10) at Riverside Stables in Sydney. The Watson family owned and run Mill Park Stud might be based in South Australia, but their reputation for producing elite thoroughbreds extends right around Australia and beyond. Top class sprinting mare Booker (above) is the latest Group I winner to add her name to the Mill Park honour roll after capturing the Group I MRC Oakleigh Plate. 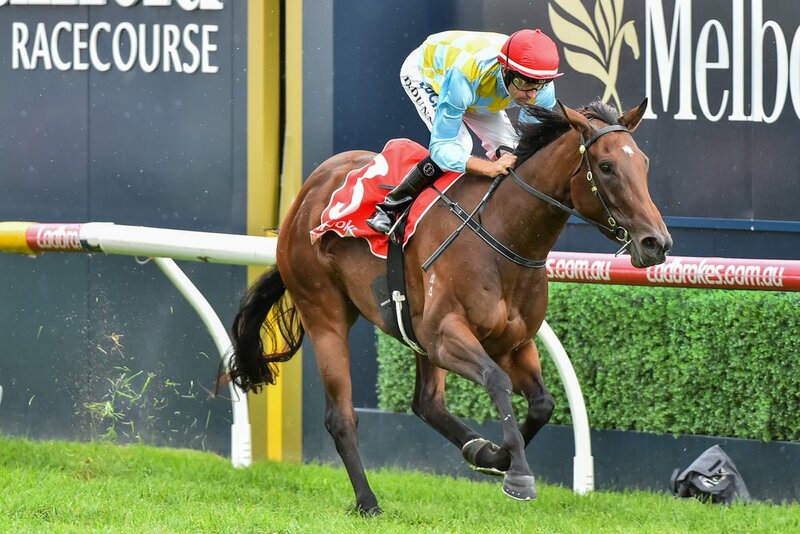 She confirmed her status as an elite speedster when overcoming a wide draw to score a powerful three-quarter length win in the prestigious 1100 metre sprint. A $230,000 Inglis Premier purchase from the Mill Park draft at Inglis Premier in 2016, Booker has returned over $800,000 in prizemoney and will be worth even more than that as a broodmare prospect when her racing days are done. Booker is the latest in a long line of Group I winners raised by Mill Park that includes Southern Speed, Rebel Raider, Serious Speed, Captain Sonador, Go Indy Go , Happy Trails and $3.8 million earner Fawkner, whose half-brother will be offered by Mill Park at Inglis Easter along with five other top class youngsters. Consigned as Lot 417, the More Than Ready (USA) colt (above) is from Group III winning Danewin mare Dane Belltar, who has the perfect record of seven foals to race all winners highlighted by triple Group I winner Fawkner, $1.1 million earning Group II winner Tanby and Group II placed Viking Star. Another highlight lot from a stellar producer is Lot 434, a stunning Tavistock filly (below) from blue-blooded Zabeel mare Elegant Eagle(NZ), a sister to the dam of Caulfield Cup winner Southern Speed from the family of Golden Slipper winner Ha Ha. This family has delivered much success for Mill Park and Elegant Eagle has the runs on the board as the dam of Group I ATC Champagne Stakes winner Go Indy Go, Group III winning sprinter Essay Raider and Group III placed Battle Brewing. The female members of this family are all being bred to the best stallions, so this is a pedigree that is only going to keep improving making this girl a real gem for investors looking beyond her racing career. First into the ring for Mill Park will be Lot 73, a colt (below) by super popular young sire Brazen Beau from Group III winning Exceed and Excel mare Just Discreet, who comes from the iconic 'Discreet' family nurtured by renowned South Australian breeder David Peacock. Just Discreet is a half-sister to Group I winner Maybe Discreet and closely related to Group II winner Serenely Discreet. This is her second foal and her first, a two year-old filly by Sepoy called Seemingly Discreet, is showing promise with a fourth and third at her first two starts in strong provincial Victorian maidens. The late Sebring features as the sire of Lot 132, a handsome bay colt (above) from Group II placed Galileo (IRE) mare Miss With Attitude, whose first two foals to race are both winners. Miss With Attitude is a half-sister to stakes-placed Oui Si Attitude, who is the dam of a very promising three year-old So You Think filly called So We Are, who has won twice this year followed by second in the Listed SAJC Laelia Stakes at Morphettville. Written Tycoon is the sire of Mill Park's current pin-up girl Booker and he is also the sire of the next two featured lots, both powerhouse chestnut colts, just like their sire. Lot 308 is a half-brother (above) to Group III placed It's a Myth and is the third foal of winning Redoute's Choice mare The Good Wife, a half-sister to four time Group I winner and $2million earner Divine Madonna and Group III winner Blessum. It's a prolific Black Type family that has also produced Group III winner Angel of Mercy and stakes-winner Maternal. Lot 326 is a half-brother (above) to stakes-winner Guard Of Honour from good producing General Nediym mare Victory Cry, who has three winners from four to race. A sibling to stakes-winners Reldas and Victory Chant, Victory Cry comes from the family of Group I winner Serious Speed and Group II winner Majestic Music. This colt's pedigree features a double cross of Golden Slipper winner Marscay as does Written Tycoon's Group I winner Tycoon Tara and his stakes-winner Danger Close.